WHAT DO YOU GET WHEN YOU CROSS a condominium with a hotel? A condo-hotel, for one thing — and the latest trend in the hot condominium market, for another. The goal of a condo-hotel is to combine the benefits of vacationhome ownership and real estate investing. As The Wall Street Journal recently put it, "(A condo-hotel) is like a time-share in that the owner pays to use a unit. But one difference is that the owner buys the unit outright, rather than just an annual week or two of use." With a condohotel, the owner gets a deeded piece of property in his own name. At a condo-hotel, the majority offer profitable twist to traditional time-shares condo-hotels Popular of owners usually participate in the property-s rental program, in which a professional property management company oversees the rental process, runs day-to-day operations and handles maintenance issues. The money that the unit owner earns from rentals can help him offset some of his costs and, in many cases, generate extra income. Property owners can also arrange to use their condo-hotel unit themselves, let their friends or family use it, or rent it out on their own. One aspect of condo-hotel ownership that holds particular appeal in today-s sizzling real estate market is resale value. While time-shares can be hard to sell, condo-hotels, according to many experts, are likely to remain in demand because they tend to be upscale properties in prime oceanfront settings. In Myrtle Beach, S.C., the Hoffman Group announced in late May that it had sold out three oceanfront condo-hotel properties pre-construction — about 700 units — in a 30-day period. The units are valued at more than $125 million and are located at the Monterey Bay Suites Resort, the Landmark Hotel and the Caribbean Suites Resort on the Grand Strand. Beachside Real Estate, based on the Isle of Palms, S.C., introduced the first condo-hotels to the Charleston area this year. Called Seaside Studios and located on the island-s popular Ocean Boulevard, the 51 one-bedroom units sold out in a week, says Beachside Broker in Charge Vicki Hollingsworth. Prices ranged from $189,000 to $274,000. The property gives buyers a rare opportunity to invest in waterfront real estate at an affordable price — and at a time when the condo market is seeing explosive growth. Exterior design plans for Seaside Studios include new paint, new fiberglass doors on each unit, and operable windows in each room to give owners and their guests the pleasure of listening to the waves breaking on the beach. There is also a new pool on the second-floor deck, along with outdoor kitchen facilities, designer furniture and tropical décor. Plans for the interior include new furniture, designer bedding and window treatments, new flooring throughout, and designer artwork and accessories. 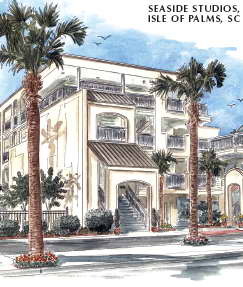 Seaside Studios is just the beginning for Beachside Real Estate in the condo-hotel market. The company recently purchased the Elliott House Inn on Queen Street in downtown Charleston to operate as a condo-hotel, and the 26 rooms there sold out in one day. "We-ve contracted the Shem Creek Inn in Mount Pleasant and are getting ready to close on that as well, and that-s close to a sell-out," says Hollingsworth. In addition, Beachside currently has contracted three other hotels in the state and plans to convert them to condo-hotels. "One of them is in a college town and the other two are on the coast," she says. While the cost of buying a condominium on or near the ocean has risen sharply in the past decade, the amount a homeowner can get from renting it hasn-t kept the same pace. Hollingsworth says many people can-t afford to spend $600,000 to $800,000 for a second home that they-ll only get to stay in three or four times a year. A condo-hotel gives them more options. Florida seems to be the original home of the condo-hotel trend. In the Sunshine State, condo-hotels are usually four- or five-star high-rise hotels towers, often with a hotel "household name" attached — Ritz-Carlton, Hilton, Four Seasons, Trump, or Clarion, to name just a few. Owners in a condo-hotel often enjoy all the perks that a hotel guest might take advantage of, such as spas, fitness centers and fine restaurants. Some condo-hotels even offer housekeeping services or a concierge. The property management company handles maintenance issues. According to a recent story in USA Today, about 30 condo-hotels are currently under construction in South Florida. While the Orlando and Miami-Fort Lauderdale areas had fewer than 1,000 condohotel units each five years ago, estimates are that several years from now, those communities will have more than 10,000 condo-hotel units — each. Condo-hotels are typically found on oceanfront property, but the trend has also swept inland — and much farther than just Orlando and Atlanta. In New York City, the famed Plaza Hotel is being converted to condos, and cities such as Las Vegas and Chicago are getting in on the action as well. One recent Las Vegas condohotel, the 576-unit MGM Grand, was expected to sell out in two years — but lasted only two months. Still, there-s something special about owning a coastal condominium. "We think the condo-hotels will really open up an avenue for people who dream of living on the coast," says Hollingsworth. "We always say, ‘When you-re living on the island, every day is a vacation,- and that-s certainly true when you own your own condo-hotel there."